I am very thankful to AVANCE because I learned many things about the development of my child. With other moms, I gathered a great deal of information about the development of our children since conception. Most importantly, I learned to manage the different stages of my child’s development successfully. I learned to understand the needs of a baby from pregnancy. My child is a toddler and I learned how to help her cope with her fears. I learned how to use common things I have at home as educational tools and how to teach my child how to share toys with other children. I learned the very many things I am capable to teach my child. During toy making classes, I learned how to make toys and use them with my child for educational purposes. With these toys, I teach my child to recognize textures, figures, colors and distinguish knowing opposites. We have lots of fun playing with them and I personally have joy knowing that I made something for her to play with. The AVANCE classes have greatly contributed in helping my child to have confidence in herself. She now has fun socializing and playing with other children. I am thankful to AVANCE because I see my child now ready for Preschool and I owe it to the team of teachers greatly. 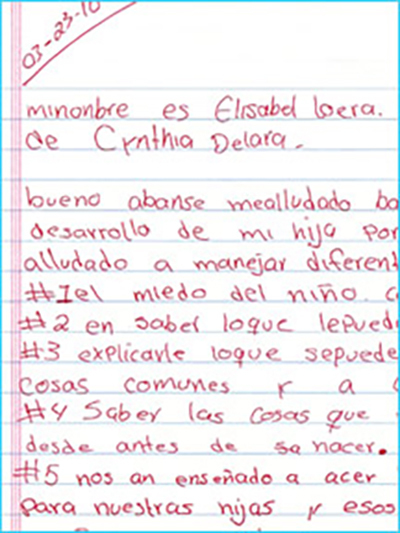 Note: This letter has been translated from Spanish and modified for clarity.